TEL: 0208 749 4056 TO CHECK AVAILABILITY. 10am - 6pm Monday to Saturday. If you wish to order online and pick up goods in store you can do so with in 7-days of purchase. Please bring a copy of invoice/order confirmation you receive via email and a valid Photo ID along with credit/ debit card used to make the purchase. Once verified we can release your goods to you. Please note we do note release products to any third party collecting on your behalf. You are able to have a refund if you try out in store and decide you wish to cancel the order. However if you try the item in the store and then take it away this will be treated as a normal store purchase and the store policy for refund and exchange will apply. PLEASE NOTE IF YOU FEEL YOUR BOX IS TAMPERED WITH - OR LOOKS AS IF IT WAS OPENED AND RE-SEALED BEFORE YOU RECEIVE IT PLEASE REFUSE THE PARCEL AS THE COURIER WILL TAKE THE PARCEL BACK AT NO EXTRA COST TO YOU. CLAIMS MADE FOR MISSING ITEMS AFTER YOU SIGN FOR THE PACKAGE WILL NOT BE ACCEPTED. IF YOU FEEL A THEFT HAS TAKEN PLACE PLEASE CONTACT US WITH A WRITTEN STATEMENT OF TIME OF RECEIVING AND OPENING YOUR PACKAGE. WE WILL PROVIDE INSTRUCTIONS OF WHAT WE NEED FROM YOU. AT THIS POINT WE WILL BEGIN AN INVESTIGATION WITH THE COURIER , CONTACT THE DRIVER AND PASS ON YOUR STATEMENT TO THE POLICE FOR FURTHER PERUSAL. WE WILL PROVIDE YOU WITH ALL THE EVIDENCE TO SUPPORT YOUR CLAIM SHOULD YOU WISH TO TAKE IT FURTHER TO THE TRADING STANDARDS OFFICE IN YOUR AREA. WE ARE NOT RESPONSIBLE FOR ANY PACKAGE AFTER YOU SIGN FOR IT. An item could be missing from your order for several reasons, more often than not because one item was out of stock. In this case you will have received and email stating this and/or your invoice will be marked as being part complete, and you will have been refunded for the item that was not in stock. If this is not the case, please give us a call and we will do all we can to help. In most cases if an item is out of stock we will contact you by telephone to inform you first. All packages are recorded for weight before they leave and each package has a recorded CCTV footage of contents packed. We also have the weight recorded just before delivery is made, so we are able to track that the correct amount of items are in the package. Pre order simply is when you are able to Pre purchase an item we release for early selling. Usually applicable to products that are in high demand and low in quantity. Your credit card will be charged and the ordered item is reserved for you until we receive delivery. Please read carefully the product description about expected delivery dates. All expected dates are provided to us by the supplying brand, sometimes delays can occur, in which case you can request a refund or cancel your order before we have dispatched the product to you. At Stuarts London we go to great lengths to ensure your shopping experience is as easy and secure as possible. Firstly you need to register an account with us. This is a very simple process and will ensure you can quickly and safely make orders. Once you have created your account, browse the site; either using the categories listed down the side, our search function, or by looking at our most recently added products. Select your size, and add the item to your cart. Once you have finished shopping simply go to the checkout, choose the method of shipping you would like and continue to payment. If you are happy with the order, please confirm the payment. We will then send you an email acknowledging that we have received your order and that it is being processed by our team. We will also let you know by email when the item(s) are dispatched to you. If in an unfortunate circumstance your purchased item falls in to our sale or any promotional** offer within 5 working days of your purchase date we will refund the difference by placing funds into your Stuarts London e-wallet in your account to use at your convenience. We reserve the right to reduce the prices on any of our products without any prior notice. **PLEASE NOTE WE DO NOT WORK THIS POLICY FOR OUR SEASONAL MAJOR SALES HELD ON THE WEBSITE OR IN STORE DURING THE WINTER SALE HELD FROM BOXING DAY 26TH DEC OR THE SUMMER SALE WHICH IS HELD FROM LAST WEEK OF JULY. I am buying from outside of the EU -Who Pays the customs and import charges? Please note we are not able to 'de-value' any invoices or mark as 'gift' in order to help you avoid your countries Custom's and Duty charges. My order contains a faulty item. If for some reason your order contains a faulty item please contact the sales team immediately and they will assist you in returning the item. When we receive the item back we will replace the item, offer an alternative, offer a refund, or in some cases send the item back to the manufacturer for repair. This however is not valid if the item has been worn or washed. I forgot to use my discount code. Can I get the discount refunded? This should never be a problem, simply give us a call on +44(0)203 905 5552, and providing the code is valid we will refund you the variance. If an order has not arrived when you were expecting it, we recommend first checking the email account your Stuarts London account is registered with. Any updates in status will be passed on via email, as it is our primary mode of contact. If you have not received any email updates, contact the web team on +44(0)203 905 5552 and we will follow up the progress of your delivery. This can take up to 24 hours but we will always be able to help. You have sent me the wrong item. If you have been sent the wrong item please follow the returns procedure and return it to us. We will send the correct item back out to you and reimburse any costs you may have incurred in sending the incorrect item back to us. If the item is out of stock for any reason, we will contact you to arrange an alternative. We use Royal Mail, FED EX, OCS, DPD and City Sprint (London Same day Delivery). Delivery is dependent on the availability and we reserve the right to use third party courier in order to get your parcel to you on time. If you would like more information on the type of courier we are going to use for your destination please contact customer services on +44(0)203 905 5552 prior to us sending your parcel. Orders received by 3pm on a weekday will be shipped the same day or in any case of unforeseen delay the following day. Orders received at the weekend after 11am on Saturday and Sunday will be shipped out on Monday. If this is not possible, or an item is out of stock, you will be notified by e-mail or phone. A confirmation of shipping will always be sent once goods are dispatched with a tracking number and link to trace your parcel. Deliveries are sent Tracked Royal mail or with DPD, a signature on delivery is required, and otherwise the driver will leave a card through your door so you can rearrange your re-delivery or pick up from nearest depo. Some larger and more expensive items may be sent by Express delivery service where we will notify you with tracking ref via email. In most cases please allow 48 hours for delivery unless you have purchased a service . Orders to British Isles, Southern Ireland please allow 3-4 working days. A Special Express Service is available for next day delivery if requested at a charge of £7.95 (Mon-Sat). Pick Up your Own parcel from a convenient location near to you. - At Stuarts London we have teamed up with IN POST UK. We have made it easier for you to pick up your parcel in your own convenient time. By selecting IN POST UK as a delivery option you can then further select a location of a Secure Electronic Locker situated in an area near you from the Options map and menu. We then post the item to the locker of your choice, where you can access the locker with your own unique code and pick up your parcel at any time convenient to you. So go ahead Click & Collect with Stuarts London 24/7. As we don't have a courier working on any Bank Holidays, please expect your delivery for the next working day. On Saturday's please order before 11am if you require a next day delivery in order to reach the destination by Monday. What To Do If You Think Your Parcel Has Been Lost Or Stolen? If you think that your parcel has been lost or stolen you must notify our customer services team within 7 working day. On orders placed before 3pm we guarantee the item(s) will be dispatched the same day, via Royal Mail UK General time is 2-4 working days or sooner. All orders over £100 are delivered the Next working day (UK orders Only Mon-Fri) as long as we receive your order before 3pm. This is of course is dependent on payment and stock availability. We do deliver on Saturday - (Use Special Delivery Next day Option - £7.95) so if your eligible for a next day service or paid for next day service, please use a delivery address where you can receive the parcel. Order on Friday by 3pm for Guaranteed Delivery by 1pm on Saturday. We do not have any couriers working on Sunday. For International Customers times scales can vary from destination to destination, however Federal Express delivery usually takes 2-3days working days on the Express service and Standard service can be 3-5 Working days. Most international parcels are sent using Fed-Ex or Royal Mail if you want us to use a particular courier please call in and we can quote you an estimated price and delivery time. Yes, please contact us via phone on +44(0)203 905 5552 to arrange a store collection. Please print off, and bring along your order confirmation, as we will require this as proof of purchase, valid identity, Credit Card used to make purchase and any Utility Bill with address that matched order confirmation. We do know this is a lot to ask for, but we need to protect our customers from potential fraud. Your postage will be refunded upon collection if incurred. If a DPD - Next day delivery is undeliverable at the address : items may be left with a neighbour or in a safe place unless you specifically say that you're not happy with that arrangement. Royal Mail tracked and Special Delivery , FED EX, and DPD requires somebody at the delivery address to sign for the package, it does not have to be the addressee. The signature is electronically logged for security. Any signature at the address will be taken as proof of delivery by us. However once a delivery is obtained at the address we cannot be held liable for packages misplaced or lost after the signature is recorded. Please make sure your select an address that you consider safe for delivery if you are unable to sign in person. We deliver to most countries worldwide, your postage rate will be calculated at the checkout when you finish your order. Delivery times vary depend on location, feel free to contact us for additional information on International orders. Some Countries are not listed on our site due to the delivery rate being high. Please call us on +44(0)203 905 5552 so we can quote you the price of delivery to your country. I am Buying from outside of the EU - Who Pays for Customs and Import Charges ? Got the wrong size or don't like the fit? You can now return your item for FREE, without any extra delivery costs, online or In-Store at Stuarts London for an exchange. Subject to our returns policy and 30 days returns period, to return an item for Exchange simply let us know that you would like to exchange your item by contacting our customer services team via email at sales@stuartslondon.com or via Telephone at 0203 905 5552. Alternatively you can exchange your item at our London shop. For directions to our store please click here. * Please note that not everything you see online is available in-store. We recommend calling a member of our shop floor team to double check whether the item you want is available by calling 0208 7494056. How To Exchange Your Item? Do you want to exchange your item from outside the UK? 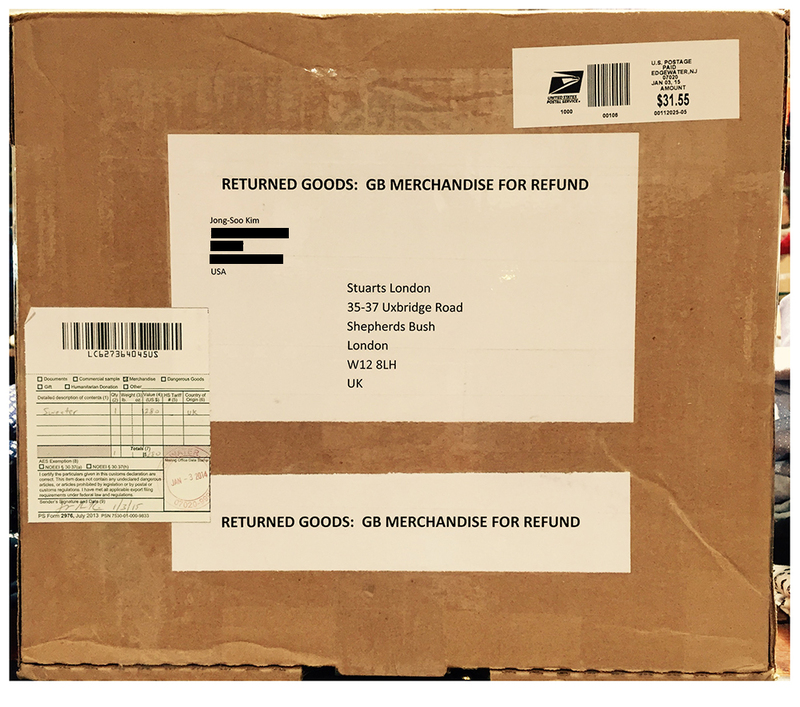 Subject to our returns policy and 30 days returns period, to return an item for Exchange simply let us know that you would like to exchange your item by contacting our customer services team via email at sales@stuartslondon.com or via Telephone by calling +44(0)203 905 5552. How To Exchange Your Item From Outside The UK? Once we have received your request for exchange our customer services team will send an INTERNATIONAL RETURNS FORM with instructions of how to return your items from outside the UK. What Happens If The Item I Want To Exchange For Is Out Of Stock? If the item you want to exchange for is our of stock, i.e. a size or colour, you can exchange your item for another one that is available online. If the value of the item that you wise to exchange for is less than the one that you wish to exchange, the difference will be refunded to you using your selected payment method. If the item that you wish to exchange for is more expensive than the item that you are returning for exchange a member of customer services will contact you when we receive your items back in order to take payment for the difference. Are There Any Items That Cannot Be Returned For Exchange? Yes. As per our Returns Policy, please not the the following items cannot be returned in the interest of hygiene. This applies to the below product types and brands. Bang & Olufsen Products - are all covered with a special company warranty on faulty items only. We cannot accept any items back from the brand the original packaging and plastic wrapping seals are broken. Can I Exchange An Item Outside Of The Returns Period? For full priced items, we are not able to exchange an item outside of our 30 days Returns Policy. For Items Marked As Sale , we are not able to exchange an item outside of our 14 days returns period as per our returns Returns Policy. For Items Marked As DEADSTOCK: These items are EXCHANGE ONLY. We are not able to accept exchange requests upon these items after our 14 days returns period expires as per our returns Returns Policy. Can I Exchange My Items If They Have Been Worn Once or If They Are Without Their Original Packaging? Unfortunately Not. Our Returns policy states that items must be returned back to use in a resalable condition. * Please note if your items arrive back in our warehouse in an unsaleable condition, they will be put on hold until we receive payment for the amount it will cost us to ship your item (s) back out to you. We request that unwanted goods must be returned back to us within a minimum of 14 days from receipt of the item(s). To exercise right to return when requesting a Refund / Exchange / E-voucher (credit note) and in compliance of the long distant selling act a maximum of 30 days is given. Faulty or damaged items can be returned within a minimum of 30 days. **PLEASE NOTE WE ARE NOT RESPONSIBLE FOR ITEMS BEING RETURNED BACK TO US. PLEASE USE A COURIER OF YOUR OWN CHOICE, WE PROVIDE OPTIONS FOR DELIVERY METHODS TO RETURN ITEMS BACK TO US PURELY FOR YOUR CONVENIENCE - THIS SHOULD NOT BE TAKEN AS A GUARANTEE THAT WE ARE COVERING THE COST OF THE ITEM AND ACCEPTING LIABILITY FOR LOST / DAMAGED ARTICLES. How do I return an Item as an International Customer ? Please highlight this to the Courier you are using so they correctly fill out the paperwork on your behalf to make sure you avoid any charges and problems with UK customs. How do I return faulty item? If you have a faulty item - please contact customer service to get authorisation number and a returns postage label. Please note that you should return faulty/incorrect items on your own accord please only send back using 1st Class postage - Recorded Delivery. We cannot refund the costs for express or next day delivery back to us and if you choose to send the item(s) in this way we can refund ONLY £3.95 at a maximum. Please contact 'Customer Services' for an authorisation number , further if we are able to help with the return postage we will do so, however this is dependant on the location of where the parcel is being sent back to us. Please note: We can only refund you the original postage cost to your destination. How do I Swap an Item using your Pick up Service ? At Stuarts London we have made it easier for you to make an exchange with our Swap It Service. Of course you can always use your own way to return the parcel back to us and we send out the first exchange back to you at no additional delivery costs, as we know its also cost you to return the parcel. We apologise that some postcodes will not be able to enjoy this service and it's only applicable for UK MAINLAND only. All you need to do is Call us to organise a Pick-UP , and our driver will come out to you at the same time with the exchange your have requested. Electrical and audio items, cannot be exchanged or returned if the original packaging and plastic wrapping seals are broken. We prefer to offer an e-voucher on sale items. However should you not find anything of else for exchange or to purchase , we are happy to offer a full refund. Please note that if any item is bought on the website and goes into sale within 5 days of purchase we will refund the difference by e-wallet in your Stuarts London Account, if required we can refund back difference. We have the right to reduce prices or place items into promotional sale without any prior notice. If you are returning an item for an exchange we will cover the costs for sending the replacement item back to you Free of charge within the UK. Free Exchanges within the UK will be offered within reason, 1st time exchange will not be charged, but we reserve the right to request a delivery fee if we need to exchange the same item(s) multiple times. We will try to handle your return as quickly as possible, and you will be notified by email when the return has been processed. We recommend that to make a note of the shipping reference provided to you when you send the items back. This will allow you to track your parcel at every stage of delivery, including when we receive it. However, please feel free to call us on +44(0)203 905 5552 and check if we have received your return. Telephone lines are open 9am - 5pm Monday to Friday and 9AM to 2PM on Saturdays. If you require any additional information on any of the products on our website please email, or call our web team on +44 (0)203 905 5552 and they will try to provide you with all the information you require. PLEASE READ IF YOU ARE MAKING A PURCHASE OUTSIDE OF THE UK & EU. Currency convertors on our UK website are a guide to giving you the current value of a product , minus UK VAT if applicable . Please note that the website will charge only in GBP Sterling and although the currency convertor guide is accurate of the current exchange rate set by the global banks, you charged amount will vary from what the credit card or payment method your choose to make a payment with. As they may offer varied exchange rates for international purchases. Stuarts London at all times only charge on our UK site in GBP. To avoid any surprises it is advised always best to check out in GBP format so you invoice displays prices correct and exactly to what you will be charged. With products selling very quickly online and in-store we cannot always keep up with every product that is sold or returned. Occasionally a new delivery or return may come in and not be put back into online stock straight away. If a size is not shown on a new item, please email, or call our web team on +44(0)203 905 5552 and they will be happy to help. Please also note that when a product is out of stock, simply click the size and colour desired on the product page, and a text will promptly appear. By clicking this the website will ask if you would like to be emailed when the item comes back into stock. Due to the limited nature of some of the products we stock we can often sell out very quickly. We do Sometimes re-stock of classic or popular items, and if you would like to ask about a product, size or colour that is not shown, please email, or call our web team on +44(0)203 905 5552 and they will be happy to help. We currently accept - Mastercard, VISA, Solo, Switch / Maestro, Visa Debit, Delta and Electron for payments online. Also we do accept Paypal and Google Wallet. We are more than happy to match the prices offered on our website to those of other online retailers in most instances. To ensure that our price matching is done fairly for all Stuarts London customers, we ask the following. Must be full price and not subject to any promotion or sales offers. Must be available for anyone to buy. We will match the price shown online, not including any additional promotional/member discounts. Must be identical to the one listed on stuartslondon.com, and currently in-stock on both sites. We will only price match UK registered companies. Although we are more than happy to do so in almost all situations, we do reserve the right not to alter our listed price. Price matches can not be offered after goods have been purchased. To arrange a Price Match, call us on 0203 905 5552 or email us at customerservices@stuartslondon.com before placing your order so we are able arrange your price match as quickly as possible. Please note the Store will only have a selection of what we have online. Please check with the store for stock availability. To guarantee a product to be there , please use the online CLICK & COLLECT service on the website. Yes, please call us on +44(0)203 905 5552 any time between 9am-5pm Mon-Friday or 9AM to 2PM on a Saturday. We do sometimes experience a high volume of calls, as such please be patient if you can not get through straight away. Your call is important so please do leave a message on the switchboard. An operator will get the right person to call back to answer any question. sales@stuartslondon.com is the email contact to use. This address is dedicated to queries regarding orders and purchases and will allow us to answer your questions as quickly as possible. We aim to answer all email within 24 hours.